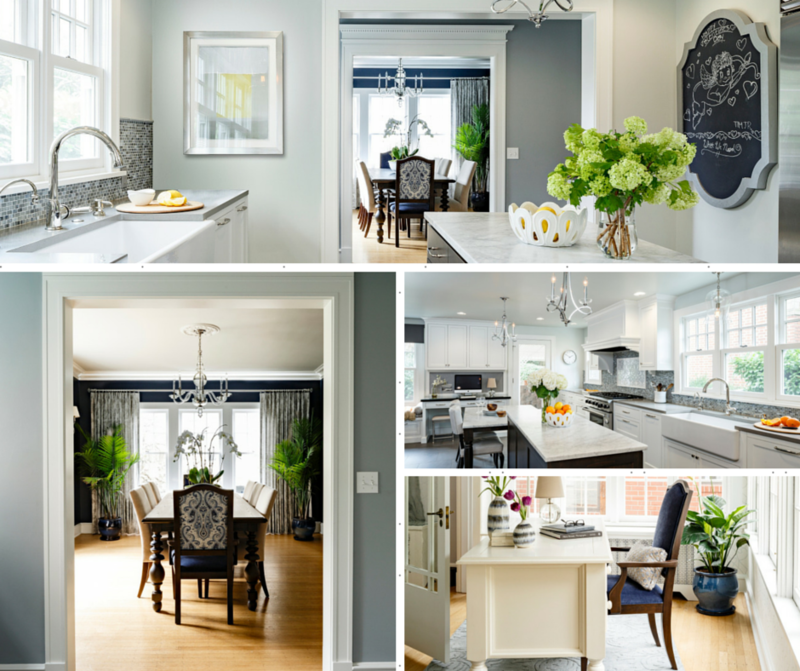 We would like to show you some of our recent remodeling projects, including a gorgeous 1920’s Arts and Crafts home, as well as a mid-century kitchen and an industrial chic basement. But we’re not just going to show you the finished product, we’re going to look at how things were before the remodeling work began. Keep reading and I hope you’ll find inspiration for your next remodeling project. Results of a 1920’s Arts & Crafts home remodel in Portland. Let’s start with that 1920’s Arts and Crafts house I mentioned. It’s loaded with historic charm and period glamor. The house, located near Portland’s beautiful Washington Park, was purchased by a family of 4 who relocated from Phoenix Arizona. This home remodeling project started with the outdated kitchen and powder bathroom. They weren’t a good fit for their lifestyle and didn’t match the home’s true character. All of the original windows needed to be reworked, lighting fixtures replaced and windows dressed up. The kitchen, last remodeled in the 1980’s, had modern white cabinets with slab door fronts, a Saltillo tile floor and a layout that lacked sufficient counter space. By removing walls and widening the entry to the kitchen, we captured all of the previously wasted space in the new design. Polished nickel plumbing fixtures and extra-wide Shaws apron sink fit beautifully into this classic kitchen. A cozy window seat was built into the kitchen that provides a hangout space for reading and homework right next to the desk. Each custom painted cabinet was designed with a specific need in mind to keep this busy family well organized. Charging drawers for each family member are hidden in the butler’s pantry. Polished nickel was used throughout for all of the lighting, plumbing and hardware because of the inherent elegance and warmth it gives off. The new layout boasts a Carrara marble island with matching table at the far end. We worked to achieve a glamorous yet classically elegant style for our client’s home. We stayed true to the home’s original details while infusing the owner’s’ style into every nook and cranny. Now the family cooks, bakes and entertains in style. Before/After Comparison of an industrial chic basement remodel. A 1970’s basement turned into an industrial chic basement with a transformation you’ll have to see to believe. The homeowners, two busy doctors, needed extra space for their soon to be teenaged children. Dark wood paneling, an unused fireplace, a maze of hallways, low ceilings and a cramped, outdated bathroom added up to one unused, unappealing space. In addition to livability and function, our goal was to create a space that reflects the people who live there. We began collecting memorabilia, artwork, old photos, and other sentimental items that help tell their story. We started with a baseball glove that belonged to the homeowner’s father, who passed away during the project construction. She said it brought back wonderful memories of attending Mariners games together. It now holds a place of honor in a custom, locally-made display case above the kitchenette. The family’s love of the Portland Trail Blazers and the Seattle Mariners shines through in the new ping pong room. A life-sized poster of Clyde Drexler, with a reclaimed fir frame, takes center stage along with custom-framed kid’s artwork, signed by Mariners legend Ichiro Suzuki. A foosball table rounds out the game room experience. Stadium lighting, locally produced sustainable furniture, and pops of red against the blue-grey and white walls, give this space a fun, contemporary industrial vibe. Layers of lighting, the perfect yellow paint and an open shower with glass mosaics and a pebble floor took the bathroom to a whole new level. Vintage fixtures from Schoolhouse Electric add a bit of whimsy along with towel “hooks” sourced at a local salvage store, Old Portland Hardware and Architectural. The kitchenette houses a microwave drawer, an under-counter fridge and even a garbage disposal. All are must-haves for messy kids and their friends. The colorful glass backsplash brings everything together and the hardworking quartz countertop ties in with the blue-grey cabinetry and custom sofa. The family’s love of travel brightened up the family room. A large, colorful wall map is the focal point and shows the children’s love of new people and places with stickers of their choosing. A recent trip to Spain served as the inspiration for the incredible local collage-style paintings of each child. A collection of vintage globes evoke both memories of places visited and excitement for the next journey. Vibrant colors play off the artwork and map. Global fabrics for pillows and poufs, a blue Eames chair, FLOR tile squares and beautiful blue-grey cabinetry are all balanced with a super comfortable, low maintenance, grey sofa. Locally made of course! Behind the cabinet doors are custom partitions for 150+ DVD’s, board games, gaming storage and AV components. The homeowner’s complete trust in us as a design and remodeling company was refreshing. And we loved how the kids were really involved with the project, sitting in on many presentations and helping with the DVD storage and pouf selections. I think they were having as much fun as we were! They spend most of their time in their newly remodeled space and show it off to their friends as often as they can. 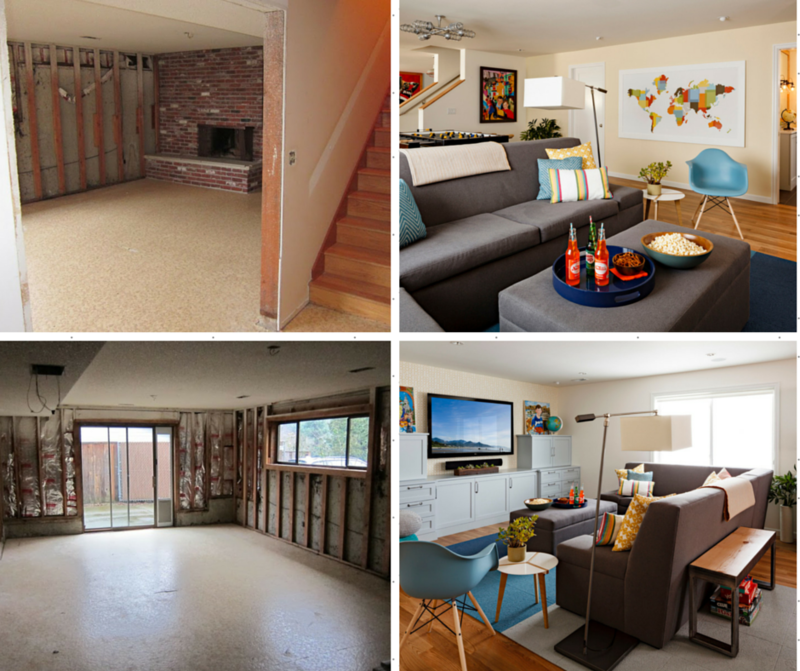 Read more about this amazing basement transformation over at Houzz. 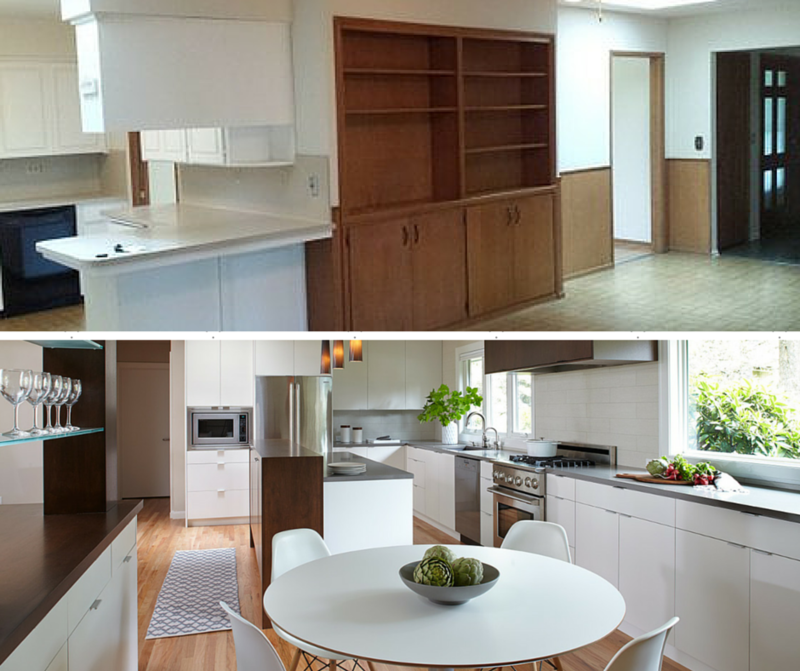 These photos show how we remodeled the first floor of this Mid Century ranch. The outdated and cramped kitchen, bathroom and hallway now shine through with a modern feel that suits the young homeowners to a tee. 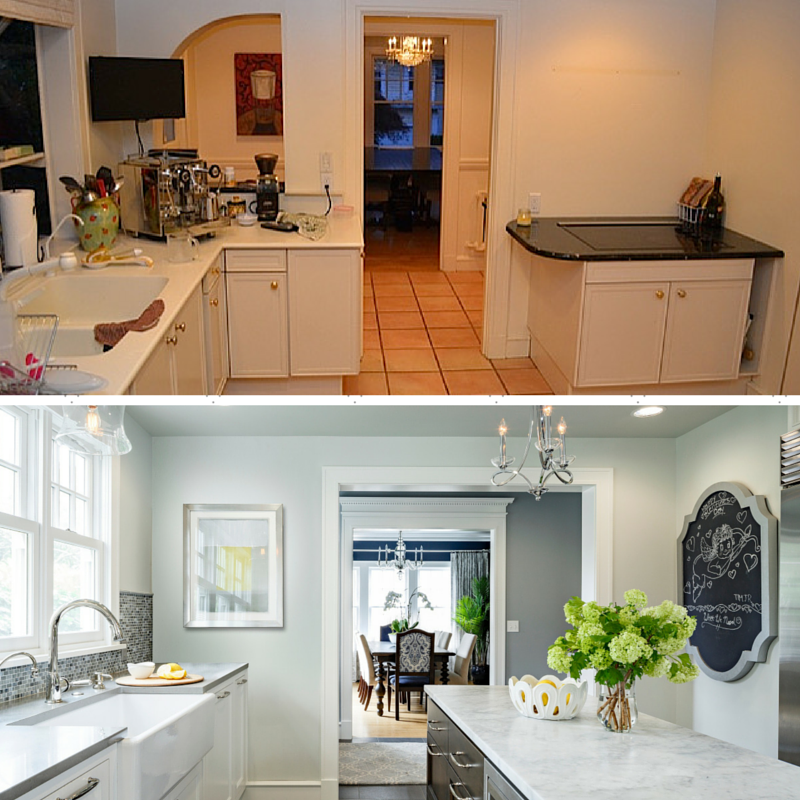 Before/After comparison of Mid-Century kitchen remodel. 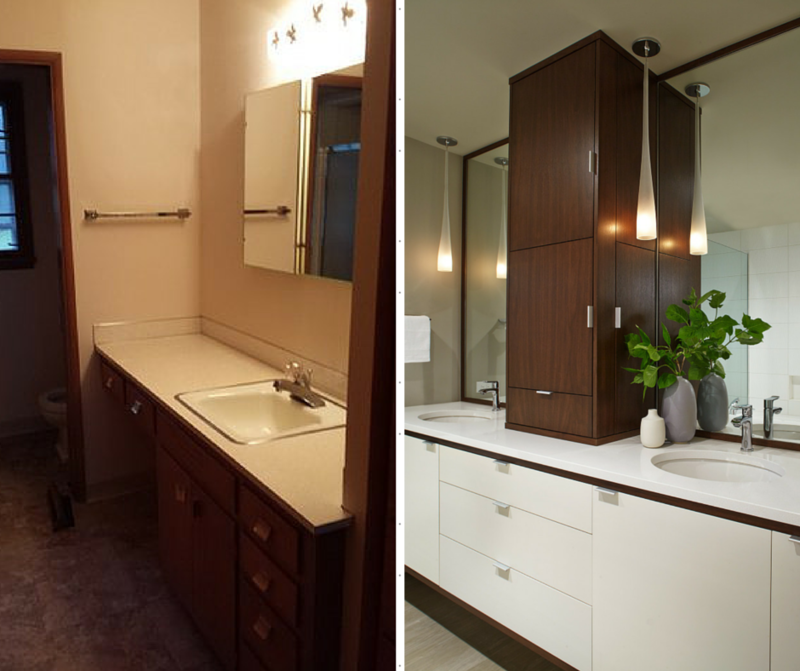 Before/After comparison of Mid-Century bathroom remodel. 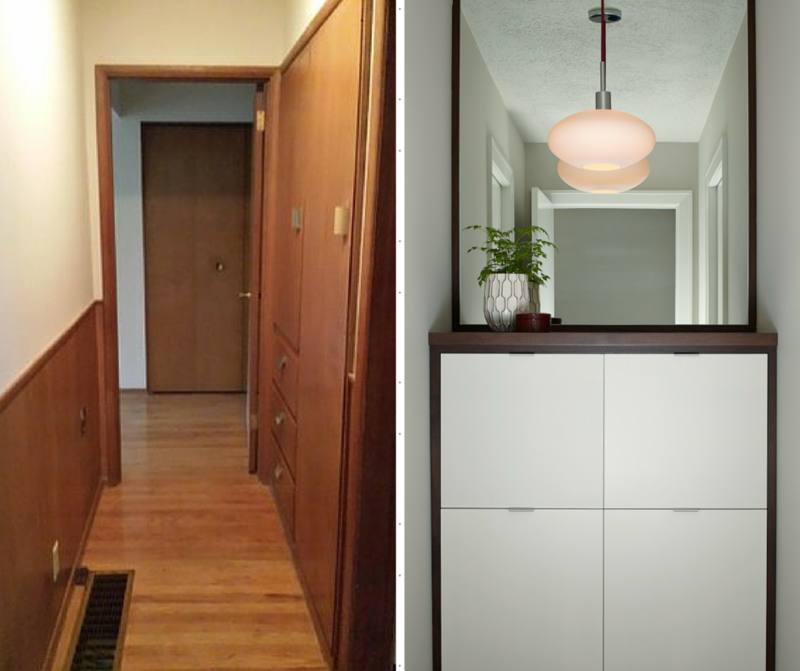 Before/After comparison of Mid-Century hallway remodel. Considering a Remodeling Project of Your Own? There’s nothing more exciting than planning and executing an amazing remodeling project, breathing new life into your home. Let’s talk about any upcoming projects you’re thinking about starting. And I’d love to see pictures of any projects you’ve recently completed, too! These are all such gorgeous remodels. I can’t get over the period glamor home’s kitchen! Thanks. It was a lot of fun to do as well, which is just as important! The before and after on that bathroom is amazing. Much brighter and inviting. Yes, adding natural light and major aesthetic updates to fit the Mid Century style were the goals for this project. Thanks for your comment!